Old Town built in a typical oriental style, Town Centre featuring a typical Mediterranean architecture built during Austro-Hungarian reign and the Modern Area including an industrial and residential zone. Trebinje is said to be the town of wine, sun and plane-trees. It has a reputation for being one of the most attractive towns in Bosnia and Herzegovina. Because of the mild Mediterranean climate with a great number of sunny days (as many as 260 sunny days a year), relatively low humidity and few cloudy days, Trebinje attracts a lot of people from different parts of the world. As a result, the clime is famous for its characteristic vegetation (pomegranates, figs, olives, grapevine and herbs) as well as a typical Mediterranean way of life. The town has a very rich history, first time being mentioned in the 10th century by Konstantin Porfirogenit under the name of Tribunia, later renamed to Travunia. The current name dates back to the 16th century. HERCEGOVACKA GRACANICA – It is situated at Crkvina hill above the town of Trebinje and built to grant a wish of a famous poet from Trebinje, Jovan Ducic. So, in the year of 2000, his remains were returned from the USA to his homeland, actually, as the poet had wished, to Hercegovacka Gracanica, clearly visible from any spot in Trebinje. It is one of the most attractive sacred buildings in Eastern Herzegovina. CATHEDRAL (Orth.) – Orthodox Church of Saint Transfiguration, built at the beginning of the 20th century is located in the very centre of the town adjoining the archdiocese with a library. THE MUSEUM OF HERZEGOVINA – An Austrian army barracks built at the end of the 19th and the beginning of the 20th century on the foundations of a Roman, medieval and Turkish settlement in the old town currently houses the Museum of Herzegovina, permanently having on display several collections of archeological finds, ethnographic artifacts and the legacy of Jovan Ducic. THE BRIDGE OF ARSLANAGIC – There are a few attractive bridges over the Trebisnjica river, the most famous of which is Perovic-Arslanagic Bridge, built by Mehmed Pasha Sokolovic in the second half of the 16th century (1574). 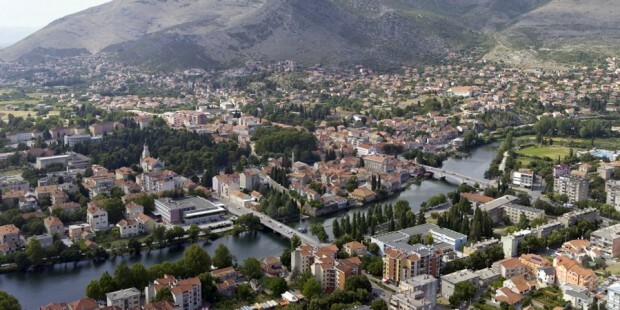 THE OLD TOWN OF TREBINJE – KASTEL – built on the river bank at the beginning of the 18th century. The existing old town has grown out of the former handicraft trade center. THE ROADS OF WINE – Herzegovina is a region rich in grapevine and small vineyards, the most famous of which are the WINE CELLARS OF TVRDOS MONASTERY. The monks have taken care of the grapevine in the fields of Trebinje and Popovo. Using a traditional technology of wine making, the current monastery vineyard makes red dry wine ‘Vranac’, white wine and grape brandy. TVRDOS MONASTERY – Built in the 13th century on the fourth-century church foundations, visible through the glass floor, the monastery has been dedicated to the Ascension of the Blessed Virgin Mary and is one of the most significant monasteries in the Republic of Srpska. In the first half of the 16th century the Monastery housed the largest collection of scriptural texts, which made it a cultural and spiritual center of the region at that time. SAINT VASILIJE OF TVRDOS AND OSTROG CHURCH IN MRKONJICI – The village of Mrkonjici , situated in the eastern side of Popovo polje on the Trebinje-Ljubinje road, is a small village where Holy Father Vasilije of Ostrog was born on 28th December in 1610. The Temple of Saint Vasilije of Tvrdos and Ostrog the Wonderworker was sanctified in the village on 12th May, 1998 and dedicated to Saint Vasilije. The temple was erected on the foundations of the birth house of the great God’s indulger and is situated on the right side of the road coming from Trebinje. DUZI MONASTERY (16th century), situated on the left bank of the Trebisnjica river, 7 km downstream of Trebinje, is known as a place which houses a remnant of the True Cross. SAINT APOSTLES PETER AND PAUAL’S MONASTERY, situated 4 km south-westwards from Trebinje, by oral tradition, originated during Apostle Paul’s missionary journey through Dalmatia. The Commission for Preserving National Heritage proclaimed Peter-Paul’s Monastery the national heritage of Bosnia and Herzegovina in 2003. PAUL’S CAVE – one of the prehistoric localities, 2 kilometers far from Peter-Paul’s Monastery. By an ancient oral tradition, Apostle Paul used to come and baptize the then people in this cave, which was later named after him. DOBRICEVO MONASTERY – Tsar Konstantin and the Nemanjics are said to have founded the monastery. The sources first mention the monastery in the 17th century, although many elements prove its earlier existence. ZAVALA MONASTERY ( 13thcentury) – Zavala Monastery has been constructed at the edge of Popovo polje (field), at the foot of Mount Ostrog. By the national oral tradition, the origins of the Presentation of the Blessed Virgin Mary Church are connected with the first Christian tsar Konstantin.